Being active starts at BOON because BOON believes that children need exercise. So you won’t find any computer games or TVs and there won’t be any permission to use mobile phones or iPads at BOON. Because being active is so important for the development of the child, both branches of BOON are located next to or on sports fields. BOON Escapade is located on the site of the RKAVIC football club, where they have access to all the football pitches, the adjacent sports hall, mini tennis courts, large play island for the older children, as well as the nearby BOOTCAMP course. BOON bij de Meerkamp offers even more. A large playing field with a complete playground during the period that the Meerkamp outdoor pool is closed. The playing field can also be used when the outdoor pool is open. Of course BOON bij de Meerkamp also uses all the facilities at BOON Escapade because there’s only a short distance between the two locations and BOON has its own transport. OUTDOOR SPORTS: Including football, volleyball, basketball, tennis, golf, lacrosse, rounders and hockey clinics. 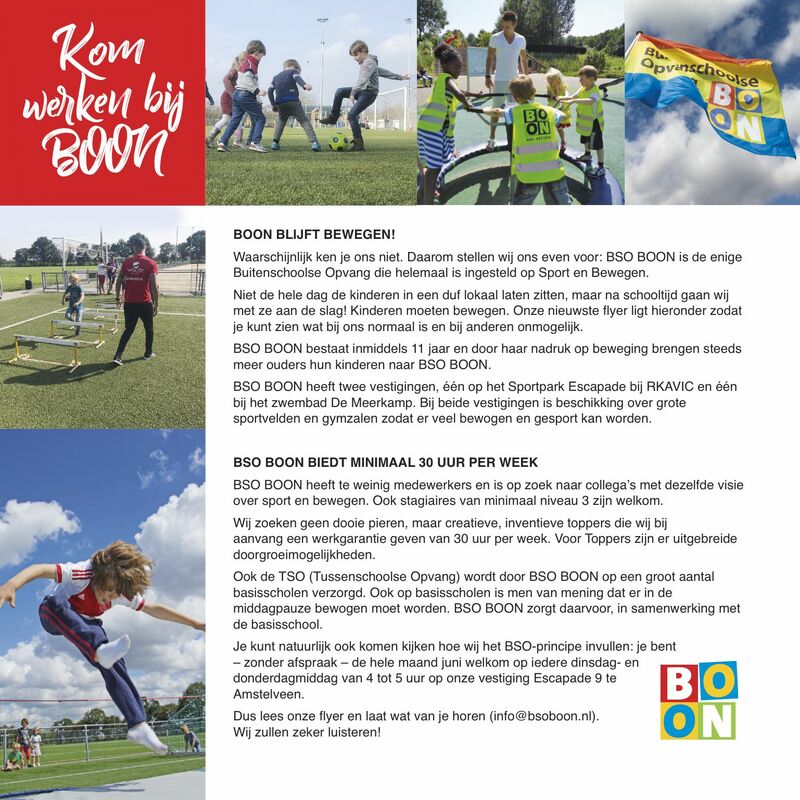 There is no limit for the sports opportunities at BOON. TENNIS: It’s possible to get tennis lessons at BOON. 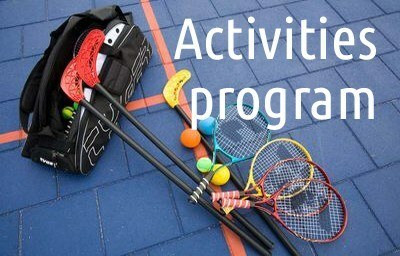 The lessons are held every Monday from 5:00 pm to 6:00 pm at Tennispark De Startbaan, under the supervision of 2 qualified tennis instructors who work at BOON. 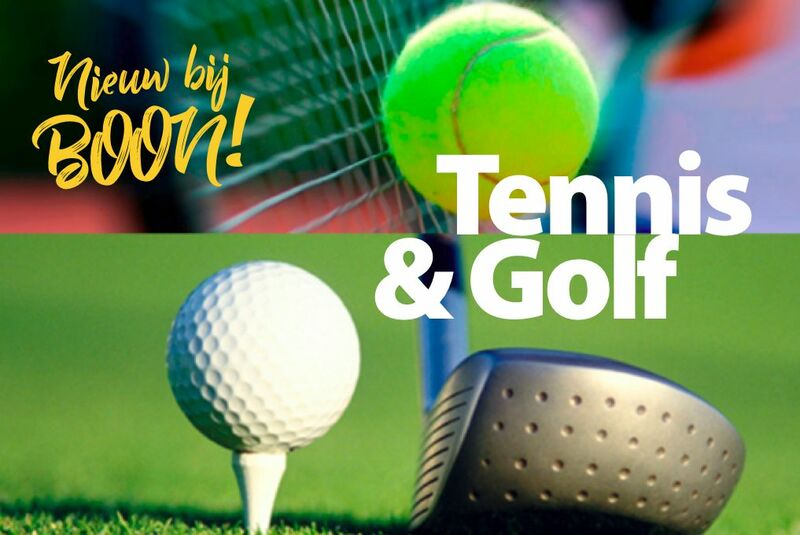 Depending on the interest, there is the chance to have a golf lesson on Mondays from 5:00 pm to 6:00 pm at GOLFCENTRUM AMSTELDIJK, under the supervision of local professionals. Older children have the chance to practice as a DJ. During bad weather, BOON has access to sports halls where indoor sports can be played. Excursions with private transportation to theme parks, the swimming pond in the Amsterdamsche Bos, the Petting Zoo near the Escapade, etc. At BOON, the children’s enjoyment is the top priority! 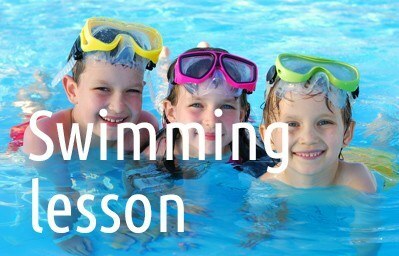 Arranging swimming lessons both at the Meerkamp swimming pool and at Health City Escapade. And of course, any required homework support. BOON has extensive opportunities for taking music lessons. BOON has its own music teacher on-site, who graduated in guitar and piano from the Conservatory in Tel Aviv. Individual music lessons on keyboard and guitar are also possible for children who don’t attend BOON daycare. 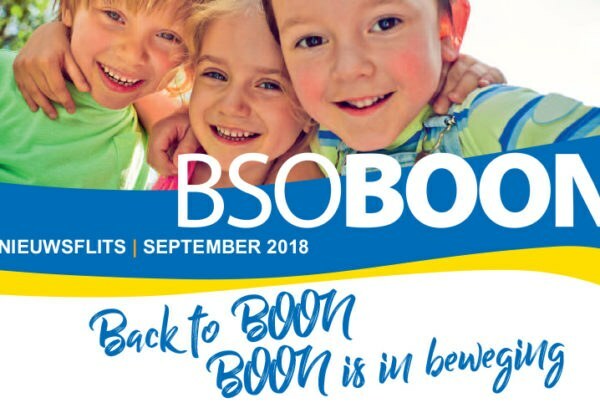 If interested, send an email to: muzieklessen@bsoboon.nl. 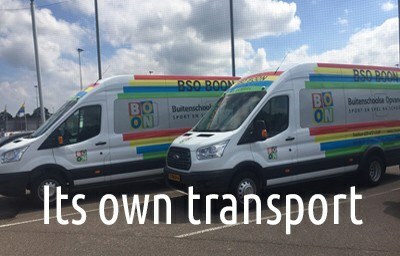 If wished, BOON can offer (for a fee) external transport to sporting facilities within the municipal boundary of Amstelveen on Monday, Tuesday and Thursday from 4:00 pm to 5:30 pm. With the exception of school holidays. In a glorious environment, located outside the Schiphol flight paths, children can enjoy and reap the health benefits of playing outside. BOON ESCAPADE is located at the Escapade Sports Park on the grounds of the RKAVIC football club, where there is access to all the soccer pitches, the adjoining sports hall, mini tennis courts and real tennis courts, a climbing frame with swings, as well as the nearby boot camp trail. BOON bij DE MEERKAMP has even more to offer. Alongside the swimming pool, there is a large, fully equipped playground, basketball court, volleyball court and soccer field, all for BOON’s exclusive use in the period when the De Meerkamp outdoor swimming pool is closed. When the outdoor pool is open, the playground is clearly divided into one area for use by the general public, and one area allocated for children attending BOON. BOON also has its own mini tennis courts. 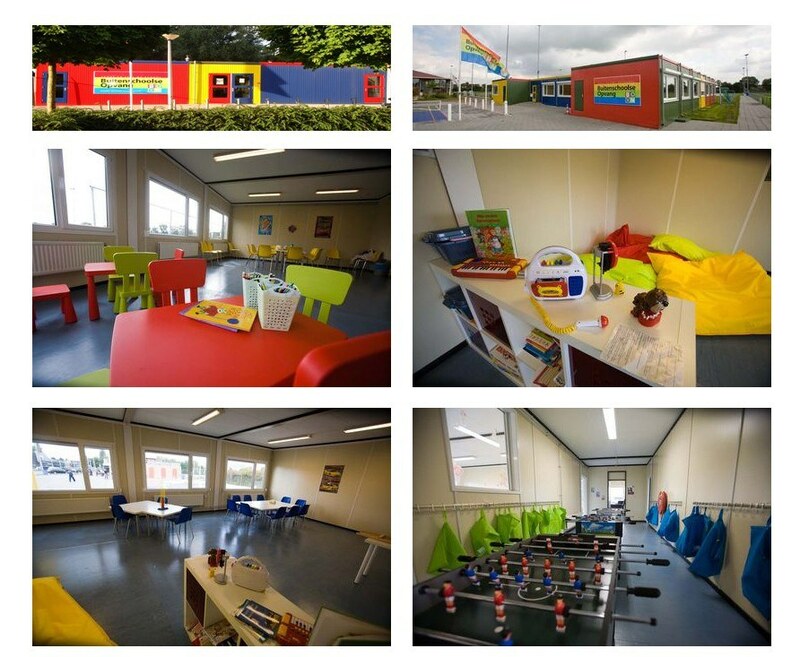 Moreover, BOON bij DE MEERKAMP also has access to all the facilities enjoyed by BOON ESCAPADE. Thanks to BOON having its own transport, the distance between the two locations is short enough to ensure that regular shuttling is possible. On Wednesdays and Fridays and during all school holidays, the two branches come together at the Escapade, which is a lot more fun for the children, because the numbers on those days are smaller. As already mentioned, the vision of BSO BOON can be summed up as follows: BEING ACTIVE STARTS AT BOON! 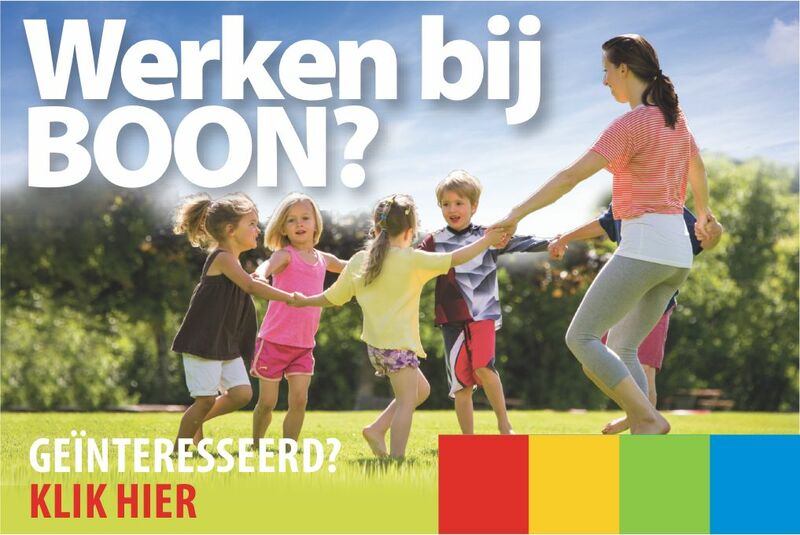 BSO BOON, the after-school care where children really move! We see a child as its own personality, which must be able to develop freely and uninhibitedly at its own pace and perception. During this exploration we stand by coaching, looking, listening and understanding alongside the child to offer structure, safety, trust and sufficient challenge. In our dealings with the children, we act according to the principles of Thomas Gordon. 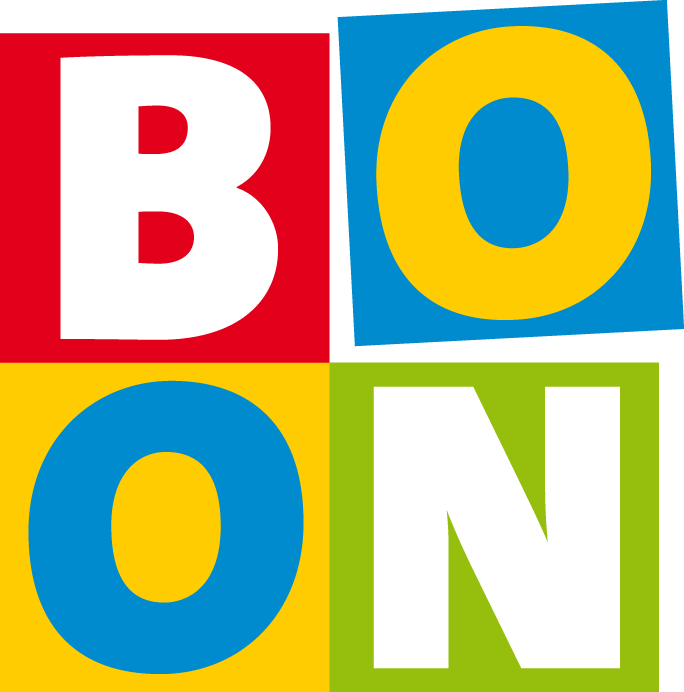 BOON creates a stimulating climate with opportunities for the child to develop their own imagination and to take initiative. Play is an innate need. Children always play. Through play, children process the things they experience every day or they can lose their energy. Children of school age like to develop their talents and skills. A wide range of activities is offered, with which we connect with this need for play and development of children. With us, moving is the means to have fun, develop yourself and maybe even discover hidden talents! During school holidays, BSO BOON is open from Monday to Friday from 8:00 am to 6:30 pm. A special holiday-oriented program is offered with as much variation as possible. With our 6 BOON buses and 3 cars we make occasional trips in the holidays. You can request a tour with us without obligation. If you are already convinced, you can also register your child directly with us. This is followed by the introductory meeting and the tour with your child.